These are the opening words of Louis Paulian's The Rag-picker's Basket (La Hotte du Chiffonnier,1885) an extraordinary book which describes the work of what we would nowadays call 'informal sector recyclers', (otherwise rag-pickers, scavengers), and the products of their labour. The first appellation is preferable, being more respectful of the professionalism of these largely very hard-working and knowledgeable people ('specialists,' Paulian justly called them). Born in 1847, Paulian (later secretary of the Chamber of Deputies) came to Paris when he was twenty, to study law. He was drawn to the study of social questions and political economy, but he was dissatisfied with the learned books he read about the poor, and decided that if he was to get an accurate account of their lives, he should get alongside them and live their lives with them. It was typical of his method that when he wrote about prisons, he had himself locked in a cell, in order that he should find out exactly what was wrong with the system. If La Hotte du Chiffonnier is anything to go by, he had a gift for getting people to talk to him. My own edition of Paulian's book is a rather pretty one, the kind people buy to put on their shelves for decoration, as you may see from this picture. What is inside is much more exciting. 'The chiffonnier is as old as the world,' says Paulian, and certainly they are still with us. 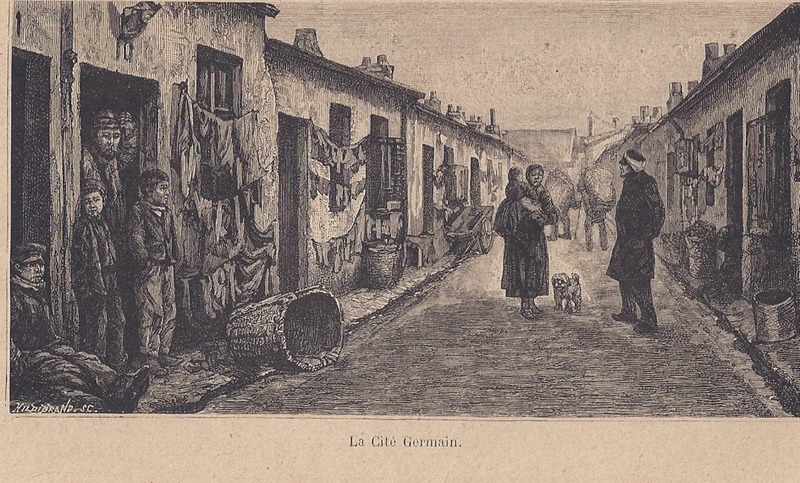 Walking down the street in Moqattam, a town of modern-day informal recyclers in Cairo,I saw sights that reminded me of the pictures in La Hotte du Chiffonnier, and indeed, this picture in the book of one chiffonniers' quarter in Paris, reminds me strongly of parts of Moqattam. Here are the specialists engaged in the hand-sorting of refuse. They knew how to distinguish between different fibres; knew which bits of bone could be used for buttons, and which had to be boiled down for glue; which bottles could be returned to which factories for refilling, and what kind of glass should be broken up for various purposes. 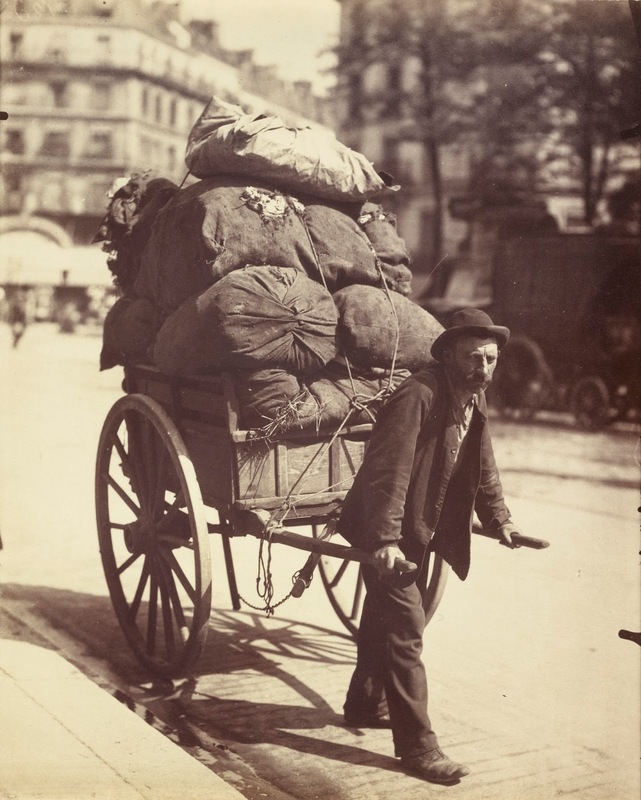 The Parisians, before Monsieur Poubelle invented his useful bin, used to tip their rubbish out directly onto the street outside their houses, and it had to go out at the same time at night; and then the chiffonniers had a few hours to rummage through it before the public service vehicles came along to take away the residual material. 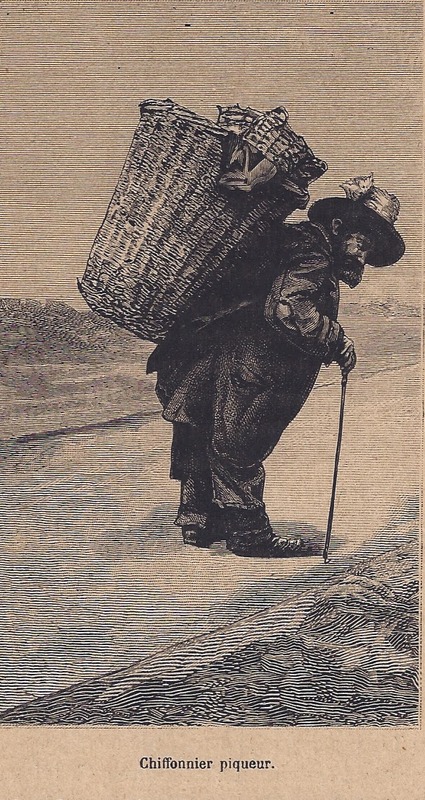 The chiffonnier with whom Paulian set off, at nine pm, to go along the streets in Paris, a 'coureur' or 'runner' he was called, carried a basket with straps on his back, also a lantern, and a hook for fishing in the heaps. If they were a nice 'sugar-loaf shape', the coureur knew that the heaps were undisturbed and full of treasure. These are some of the things Paulian's companion unearthed from them: a mesh of women's hair, a bone (which he had to fight a dog for); paper, wine-corks, woollen rags, bits of flannel, rags from sheets, sardine tins. He didn't like restaurants: they were too thrifty and would boil a bone, for example, till there was nothing left in it at all. He also picked up crusts of bread. 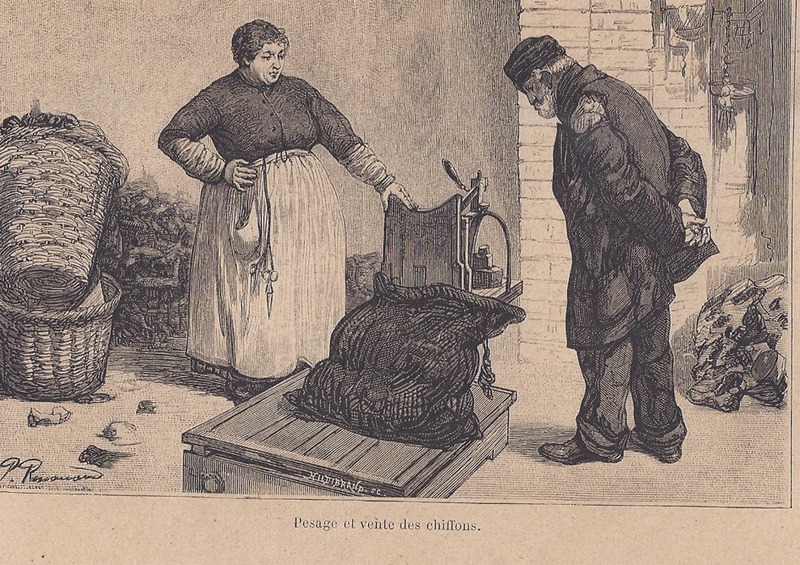 In Parisian households, the cooks usually gave clean bread straight to the chiffonniers, but threw the dirty bread in the bin. Clean bread went home and was dipped in soup to soften it and make it fit to eat – this is hard stale baguette we’re talking about! If there was a surplus of good quality waste bread, it was sold on, via a middleman, mainly to feed the children of poor Parisian tradespeople who were being reared by women in the suburbs. Soiled bread had plenty of uses; the best was fed to pigs, rabbits and poultry, and the chiffonniers’ horses, if they had them. Bread that was so filthy that the animals would refuse to eat them would be roasted in an oven and then sieved. The coarse crumbs that wouldn’t go through the sieve were sold to restauranteurs in the Quartier Latin for breadcrumbs. These restaurants were used by students, who bought their dinner for 90 centimes, and neither knew nor (Paulian suggests) cared that their hams and cutlets were coated with bread that had been rejected by animals. The burnt powder that was the residue of this process was made into tooth-cleaning powder and ‘chicory’ which was sold in grocers’ shops. Major yuk factor, but the roasting probably got most of the bugs out of the bread, at least, and there wouldn't have been oil in the gutters as there would be nowadays. The chiffonnier also found a chicken head, which would make a pot-au-feu for his family's dinner. Like a Chinese gourmet, he thought chicken head was a pretty good dish. Another time, he found some thrown-out calf's liver, which made wonderful eating. Other things in his haul; an old umbrella, a lady's corset, a soldier's epaulette, a gilt button - and so on. Small things which, collected together, represented a mine of metals, foodstuffs, raw materials. There was a hierarchy of informal recycling work; the coureur, who you have just met, was at the bottom of it. Then there was the placier, who came every day to better-class houses. He would run errands for the cook and generally help out, and was effectively a member of the staff. Of course he put the rubbish out (having sorted it out himself and got the pick of the refuse.) 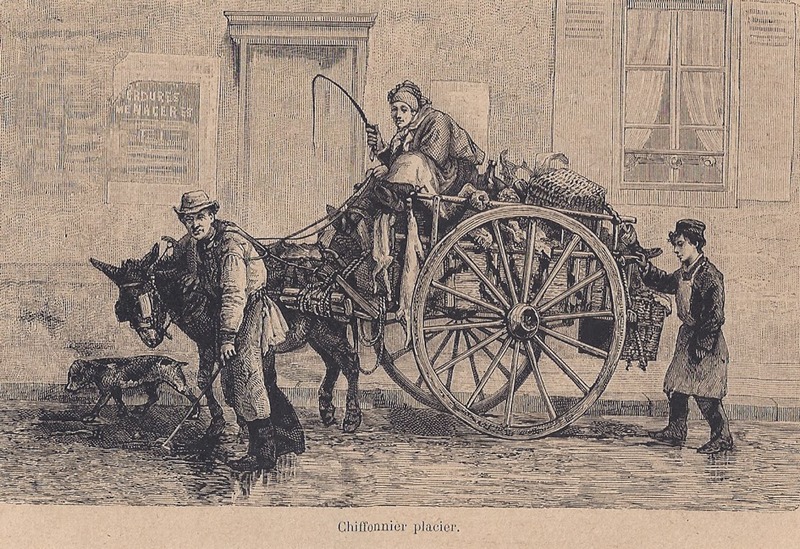 The placier would often have a horse or donkey, as here illustrated, and a cart to take his stuff home in, and might aspire to raise himself to the next echelon, which was the middle-man. These entrepreneurs bought from the collectors, and then sold on to the factory-owners who processed the refuse, some of whom had once been humble coureurs. Like old Harmon in Our Mutual Friend, the entrepreneurs could become wealthy men. The coureurs themselves, sometimes people who had come down in the world, sometimes sons and daughters of other chiffonniers, lived a pretty hand-to-mouth existence, and tended to drink heavily in their leisure time. But they valued their independence. Though they consented to wear the metal ID discs the authorities insisted on (the idea was to restrict the numbers of chiffonniers), these were made a mockery of when the possessor of the disc took his whole family out collecting with him, and attempts to prevent them collecting at all, reducing them to employees who would sort refuse and sweep the streets, were strenuously and successfully resisted. In practice, the ID discs rarely held the details of the chiffonnier who was actually using them. The chiffonniers went by nicknames, like 'Poil aux Pattes' (Hairy Paws) or 'Gras d'Huile,' (Oil Grease) - this latter was the moniker of an old woman called Rosalinde Famion. 'Sac d'Os' (Bag of Bones) was another one. They took the refuse they gathered up to their townships, and Paulian estimated the accumulated income of one of these townships at 12,000 francs a year. The rooms were often windowless, and were no bigger than a prisoner's cell, with earth floors. They were furnished with things picked out of the rubbish, 'the richest,' Paulian tells us, 'contain a bed, a table and a chair, or rather something that resembles a bed, a table and a chair.' The poorest had only the bed. Some had nothing except a thin heap of straw picked up in the street. So lived most of the men and women whose hands gathered from the throw-outs of bourgeois society, the raw materials of recycled wealth. It's been hard to keep this blog within some kind of bounds, so I have decided to split it into two. Next month I shall describe in more detail the products that were made from the rubbish, with illustrations of the machines that processed them. I'm pleased you mentioned 'Our Mutual Friend' - one of my favourite Dickens novels. My husband's grandfather, whom he never knew, arrived in Cardiff from Russia with nothing. He set himself up as a rag and bone man (the British equivalent of Chiffonier and his descendants have great cause to praise his wisdom. Wow! John Thompson, the photographer, as well as taking amazing photographs of China, also did a volume called STREET LIFE IN LONDON, which has photographs of rag-pickers and other informal recyclers. Henry Mayhew also describes the informal recycling in London, in LONDON LABOUR AND LONDON POOR, but he did not have so close a focus as Paulian did on the chiffonniers. That is not to say that I don't think Mayhew's study is not a wonderful work, both of research and of literature. Ghastly and fascinating at the same time! Well, it clearly isn't desirable for people to live in such poverty - though there are plenty of such people around in the Third World and Eastern Europe nowadays. They are not all desperately poor, however, and they do play a crucial part in recycling. When I talk about the processes and products next month, I shall talk about how the French used waste as a resource, and a thing of value, which is a lesson we could learn from those times - especially with the price of raw materials shooting up as it is nowadays..